So, the other part to this board is an attempt to improve the speed of production. I've blogged about this before and come up with a few different ideas but I keep coming back to the general approach that Brokite use. There setup lets the make a kit of all the pieces and so when the board is made the core and inserts, rails, laminate all go in at one time so no waiting for epoxy to cure time and time again before getting the board done. Eliminating waiting this way is the low hanging fruit in improving the speed that a board can be made. 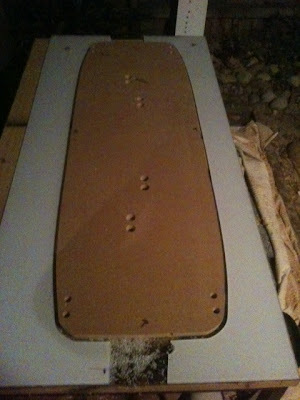 To date I've had to wait for epoxy for the core material (planks of layers), inserts, rails so at least 3 x 10 hour waits. First things first, the templates for the board and the rocker table. I used 16mm MDF cause its cheap and dense. I had some 4mm perspex that I bought from our local recycling center and so once I'd cut out the board template from MDF I placed it on the perspex and used the 9.5mm inverted flush trim router bit to cut out the outline of the board with the 9.5mm channel all the way around. These pieces will ultimately be used to hold all the board pieces together once they are assembled and layed up. I haven't quite worked out how to secure under the vac bag but all in good time. The core is going to be 6mm thick so the 4mm perspex will ensure that these mold pieces done' interfere with the glass bonding to the rails. Next up is prebuilding the inserts. Again recycled perspex to the rescue. I cut a piece of 6mm perspex lengthways, pushed them back together and clamped them in place then used 16mm and 25 speed bores to drill the holes centered on the lengthwise split. But 'gluing' pieces back together with silicone sealant I created the moulds for pouring the inserts. I used a bit of mould release but it probably wasn't needed. I mixed up 40gms of epoxy and but a very small amount of q-cell in it just o discolour it because I am using the M6 stainless steel locking flange nuts for the footstrap inserts and I didn't want them to be too visible. I filled the nuts with wax and washed them in isopropyl alcohol to get any contaminants off. I need to use these nuts as the board is only going to be 6mm thick and so the bolts will need to go all the way through the board to avoid the risk of delaminating the glass underneath the inserts and to provide enough thread for the bolts to get a good grip on. Then I placed masking tape on the underside of the mould plastic to create the complete mould and poured the footstrap inserts and also the fin inserts all in one hit. When it had all cured the inserts popped out easily and the mould is entirely reusable after a bit of fresh silicon is used. There is some extra meat on the inserts ( I purposely over-filled them) so that then can be sanded back to rough them up for better bonding. The wax stops the epoxy getting into the thread and avoids the need to re-tap the thread. So now I've got the inserts that can be placed in at layup time and I can make them whenever to build up a stockpile. Net step will be cut the core pieces and the rails. Do you think it might be better to make a slight cone shape? Sort of like a sides narrowed by a few degrees? 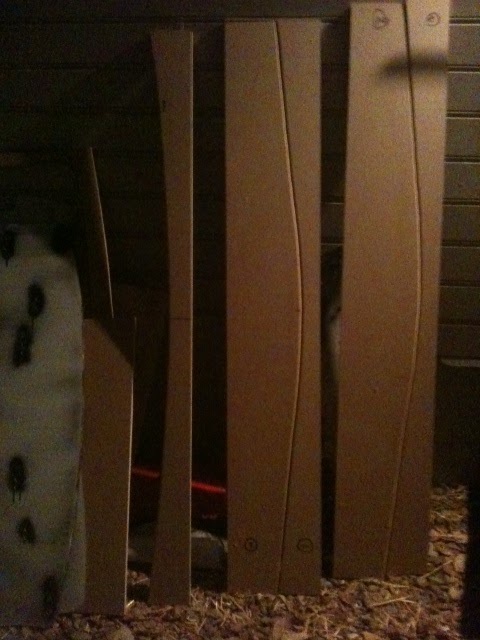 Particularly for the fins where the screws a pulling fins into the wood, not compressing like sometimes on footpads. Hey Dean. Yeah, putting a taper on them might be useful. I've got the straight edge ones done will have a chance to test them out next board. 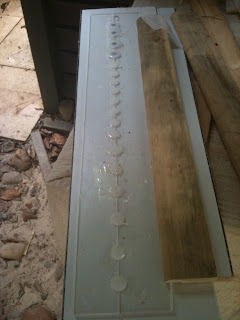 Maybe will try making tapered moulds next time. 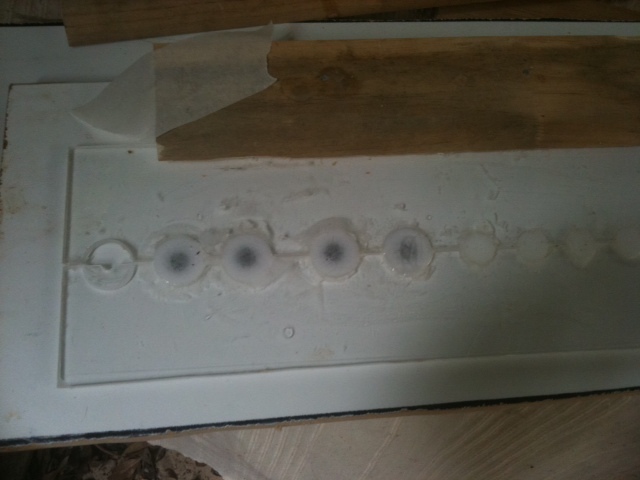 I used a jigsaw with a metal cutting bit, standard speed bores and a router on slow speed. I had to take it quite slow, especially with the router, otherwise in slowed the router down too much. It wasn't much different to cutting wood.